This is a conversation on behalf of WriteShop. Opinions are 100% my own. Teaching writing can often be an overwhelming gig for the homeschooling mom. Can I get an amen? It’s an important skill so it must be addressed in any academic homeschooling plan with a writing curriculum, but …. When WriteShop Junior Level E arrived, I was incredibly hopeful. Sure, it was pretty and shiny and had lots of colored papers (homeschooling moms like those as much as kindergartners), but it was more than that. It had plans, hands on activities, and intentionally interesting to children tasks (not to be confused with tasks that adults think are interesting, but actually are dull to kids). And it was all laid out for me. Oh, my golly. I may have giggled. 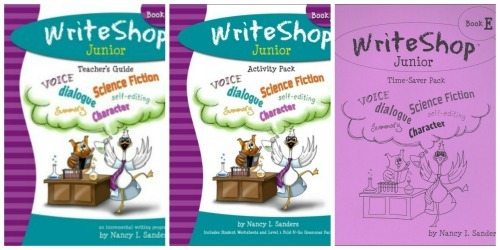 To use WriteShop Junior, you will need the Teacher’s Guide and the Activity Pack. Yes, you need an activity pack for each child using the program. You can, however, order the Fold-and-Go packet and then ph0tocopy the white worksheets from your Activity Pack, if you plan to use the specific level with more than one child at a time. I have the Teacher’s Guide for Level E, one Activity Pack, and one Fold-and-Go packet. ETA: I failed to mention something that is a big deal to me and will be to other homeschooling mamas, especially those with many children, so… This program has hands on craft like activities and little projects. Honestly, that scared me to death and almost prevented me from using the curriculum. I hate crafts. I do them every once in awhile, for the children’s sake. Period. BUT these little projects are super easy, require little “stuff”, and make very little mess. Truly. They are worth it and WriteShop has made sure they are painless. I’m so so glad. I have been using this with Esther (fourth grader) and Phoebe (delayed sixth grader) with lots of success! The kids are happy and I am happy. This is what is known as “Answer to Prayer” or “A Rarity in the Homeschooling Writing World”. It has hands on craft like activities that teach. There are worksheets that don’t look like worksheets but still reinforce a skill. It includes fantastic reference tool activities that I know my kids will refer to for years. The writing assignments are so kid friendly, it’s unreal. 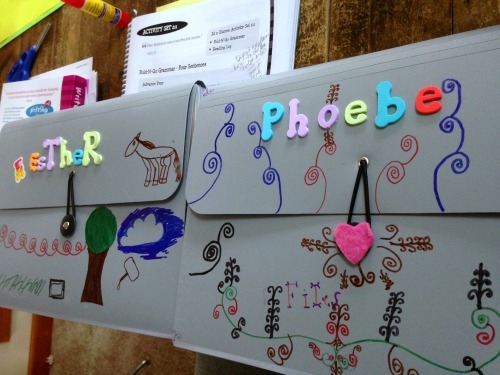 The step by step lesson plans are seriously teacher friendly. How does WriteShop Junior work? Wonderfully. Oh, you want more? Each lesson lists the prep work and materials needed. You read it quickly as the mom, then you read the dialogue, then you do the lesson together (could be writing skill, prewriting, modeling and teaching, brainstorming, writing, journaling, publishing, or evaluating). Yup, that easy. This is an incremental program that includes writing skills, practice, and development as well as hands on reference folders that the child can use through the year (and after that too). An activity packet that has both the parts of the reference folders and the worksheets for each skill and type of writing in an important aspect of this program and really makes it work for the children. The kids actively participate in this. Cutting, pasting, and more. Gathering materials before you start the program is key. WriteShop knows homeschooling moms well, it seems, so they list everything at the beginning of the Teacher’s Guide. I bought everything we needed and created our writing area resources. The Teacher’s Guide provides the lesson plans (you can choose a three week schedule for each lesson or a two week schedule AND it also provides a three week lesson plan schedule for those who are using different levels of WriteShop Junior!) as well as the dialogue for each mini lesson within the lesson. There are ten lessons in Level E: unique character and unique voice, humor and dialogue, scene and setting, blending fiction with scientific fact, using elements of a mystery to write a story, creating a shape poem, story about a personal experience, personal story describing three items or events, responding to literature, and collecting facts. 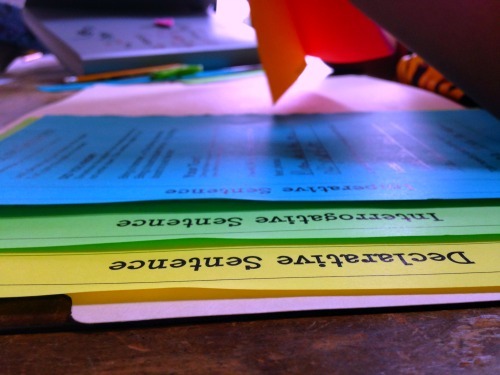 What makes WriteShop Junior different than other writing programs? The writing skills that are actually writing skills as opposed to writing basics. The scripted lesson plans for the mama. The types of “papers” written are super kid friendly. The way the child is involved brings ownership. The ease of use for the mom. The long term reach of the lessons. Yup. Not your typical boring writing program. I am thrilled to have found this writing program and believe we have finally found the Brouse Family Writing Curriculum. Are you on Instagram? Show off your creativity with a photo writing prompt. Use nature, toys, kids, whatever. Or, make a collage like a comic book. Follow WriteShop on Instagram and then share your image with the hashtag #writeshopwriting. Be sure to tag @WriteShop in your photo. Their team will be choosing from your photo writing prompts to share in their social media! I shared mine already. 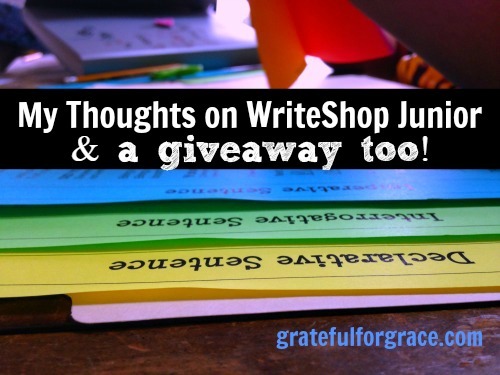 Enter the giveaway for a complete WriteShop program of your choice! Read other reviews on the Linky! Giveaway product provided by WriteShop. Winner will be selected and notified by email on April 4, 2015. Winner has 48 hours to respond or another winner will be selected. If the winner is a US resident, a physical product will be provided. If the winner lives internationally, only a digital product will be provided. Void where prohibited.